Have you heard about ModCloth? It is my absolute favorite online shop right now. If you are looking for a dress for pretty much any occasion, you're bound to find it on ModCloth. I love the site's vintage styles....especially the 50s inspired dresses. The "fit and flare" section is my favorite. Here is a dress I wore at a vineyard in California. I loved the mix of blue and red in this dress and I thought it was perfect for the California trip. "Ju-leee! Ju-leee!" Johnny sang while dancing around the room with his sister. We all stopped. "Did you hear what he said?" Julie asked excitedly. "He said Julie! With an L! He's a big boy!" To an outsider, this appeared to be a moment of sibling bliss. Both kids laughing and playing sweetly together. There might have even been a hug involved. But, Scott and I just looked at each other and sighed sadly. He said the "L". He said the darn "L". I know Johnny is four, but I loved how he still used "w" for all his "L" words. It meant he was still little. Of course I want my kids to speak properly and use correct pronunciation, but I can't help but want to hold onto their little baby quirks for as long as possible....especially since there will be no more babies in our house. The rest of the day Johnny delighted in trying out his newfound ability to say L. It was kind of cute because it seemed to take him extra effort to adjust his little tongue to say the "L." When he wasn't thinking about it, the "W" popped right back in. That night before bed Johnny said "I wuv you Mommy." I certainly didn't correct him. I may have moved away from Charm City almost 8 years ago, but I know my crabcakes. Don't give me filler. Use only lump blue crabmeat. Don't let me spy pimentos. And don't hold back on the Old Bay. Non-Baltimore friends and family tease me, but I will never ever eat a crabcake anywhere but Baltimore. So, when I return to my favorite city in the world for a visit, I can never eat enough crabcakes. This most recent trip we were in the Baltimore area for three days and I ate four crabcakes. One was served at our friend's wedding reception, so that doesn't quite count, but you get the point. I have to say my favorite for that trip was from G & M Restaurant and Lounge in Linthicum. I was taking Scott back to the airport that Sunday afternoon and we were determined to eat one last crabcake before leaving Baltimore. 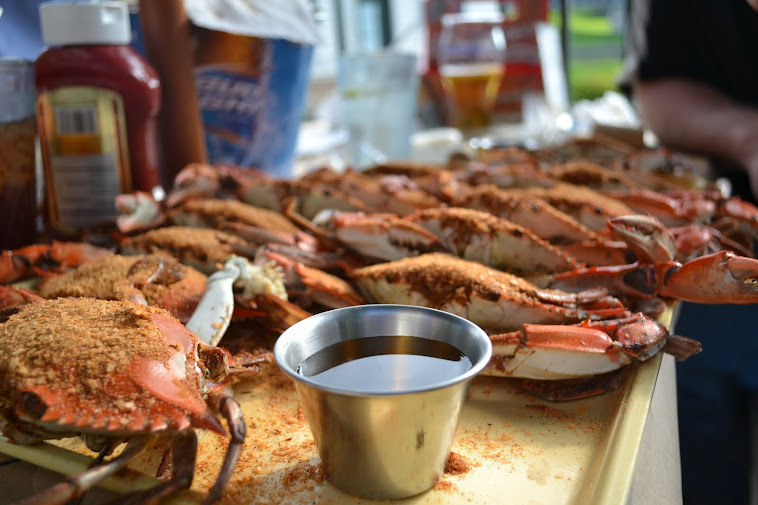 Searching the internet for a perfect spot not too far from BWI, we found G & M, which earned great reviews on Yelp for crabcakes. The parking lot was packed, but we were seated immediately and greeted by one of the best waitresses we have had in years. I might have been a tad biased as I nostalgically admired her familiar accent and Orioles t-shirt, but she really was exceptional. The crab dip was a little too creamy with not enough Old Bay, but the crabcakes were perfect. Almost completely pure crab, seasoned generously with Old Bay with no filler. Spending time with family means you get to know your family members a little better, which isn't always a good thing. You notice their little quirks or see their wrinkles a little more clearly. When you only see people once a year, age becomes more noticeable. This particular reunion last weekend in Pennsylvania we all noticed some changes in Uncle Don, my mom's brother. He is 76 and he lives in New York with his wife of almost 40 years--Denise. They never had children, but they love animals and take in any animal in need. At the moment they have four dogs and three cats---all older animals who need homes. Hysterically witty, Don is the second of four kids. His laugh was always boisterous and somewhat obnoxious, but full of pure joy. He always made us laugh. This time, however, he kind of made us cry. We have been hearing about Uncle Don's developing signs of dementia for a few years now. Aunt Denise fills us in on the stories and her concerns. This weekend there was no denying his state. He wanted desperately to be included, but it was almost impossible for him to carry on a normal conversation. He repeated jokes or interjected comments inappropriately. I know he didn't know who I was and was confused who Julie and Johnny belonged to, and sometimes he was unsure what we were doing. But he was absolutely delighted to be with family. He knew his brother and sisters (including my mom) and loved hiking, laughing and sitting by the campfire. The Carson siblings on the Carson trail. It was so hard to see my Uncle Don this way, but it was important. We still love him even though he's not how we remember him and once and a while we'd see a glimmer of the old Uncle Don. Saturday was a big milestone. It was our last "friend" wedding. Karen and Rick, our good friends from Baltimore got married and we had a blast. 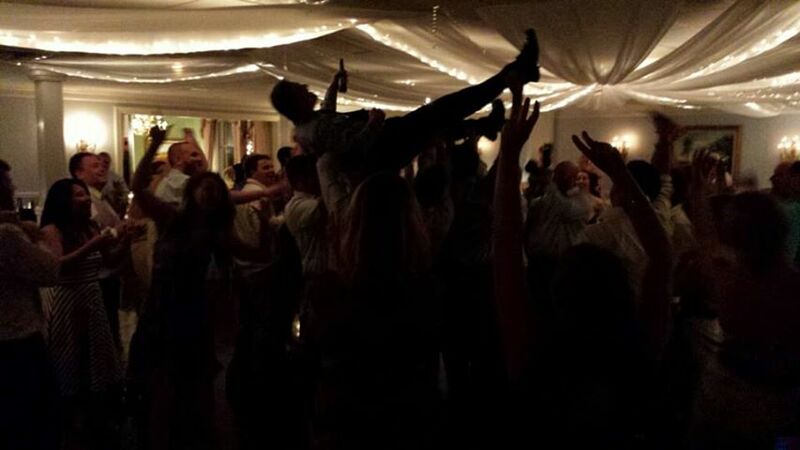 Each wedding has gotten progressively more fun, to the point that we have weddings down to a science. We are goofy, crazy, out-of-control and have the absolute best time at our weddings. A few weddings ago we started "Weddingopoly", a goofy dare game playing off inside jokes and stories about our group of friends. This wedding's highlights included Scott crowd surfing, our friend Dan starting "Double Dutch" and a spirited toast using the groom's made-up drink "Nerd Bombs." Now that we're all in our mid-30s, married and most of us with kids, we're onto a different phase of our lives. We may be through with weddings, but I'm sure there's more fun to come. Not only was the wedding amazing, but I was super happy with my new dress! I was so close to wearing an old polka-dot number. On a whim, I stopped at Nordstrom's and found this beauty. It looks about the same except for the new windows and "Welcome" sign at the front door. The house is still in need of a paint job, but I was glad to see it was the same old "yellow house." I think Julie and Johnny would have had a conniption if our old house was anything but yellow. We are visiting my parents in Maryland this week, but a quick trip to Altoona---our home of seven years--was definitely on the agenda. Driving by our little house on 5th Avenue, the memories flooded back. The baby swing on the tree, which last summer, was never rehung. The playdates in the backyard when the kids rolled down our hill, standing up dizzy and completely covered in grass. The Fourth of July nights when the neighborhood kids waved sparkers and sprawled on the grass and watched as Scott set off amateur fireworks. We didn't live in a dream house or a bustling city, but it was a good life and it's where our kids grew up. We had awesome neighbors and we lived a few houses away from our best friends, who we spent some time with today. Before heading out of Altoona, we visited some of our old hangouts--Slinky Action Zone, an indoor play place where the kids spent the day running around, navigating tunnels and slipping down slides, and of course we gobbled soft serve at our favorite ice cream spot: Meadows Frozen Custard. Let's admit it. We all want our kid to be the one who whacks the ball into the outfield and whizzes around all the bases. Tonight that was not our Johnny. It was our first real tee-ball game and we were all excited. Uniform. Glove. Hat. Good attitude. Johnny was prepared. But, when our little guy got up to bat, he literally looked like he had never seen a baseball bat. He held the bat upside down. He hit the ball towards the catcher's mound. He missed twice. When he finally hit the ball, it toppled off the tee, two inches away. "Run Johnny!" Scott yelled, obviously wanting to end the torture. "Sorry bud. That's a foul," declared the coach. Seriously? Since when are there fouls in 4-year-old tee-ball? So, we all winced and crossed our fingers as Johnny clumsily tried to hit, until finally he hit the ball past home base. He ran slowly to first, tugging off his bulky helmet, and singing a song along the way. The rest of the game was pretty much the same. He fetched a couple balls in the outfield, but Johnny spent most of the game looking curiously around the field, making goofy faces at his friends and singing silly chants. When the game ended, he shook hands with the other team, high-fived his friends and skipped over to us. "Wow. That was a good game," he announced. Anyone who knows me at all knows my about my deep love affair with ice cream. Not just any ice cream. Hand-dipped just won't do. It's all soft-serve for this girl. The frozen yogurt bar phenomenon is absolutely delightful. 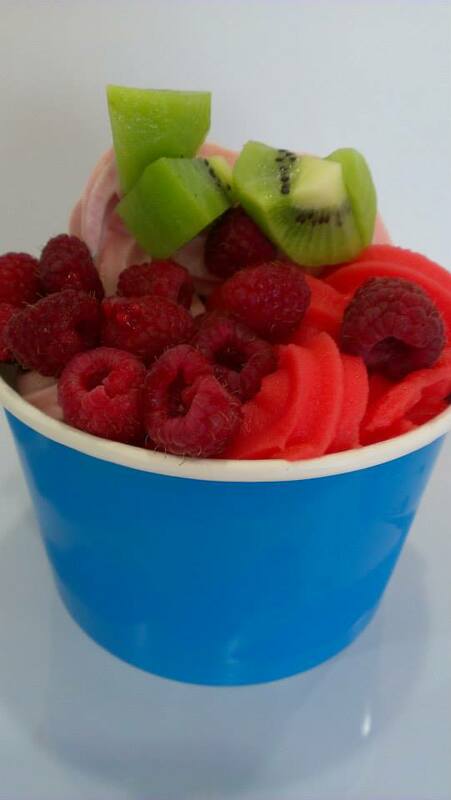 Not only do we have delicious Red Mango in our town, but we have a new hot spot: Snow Spoon. Walking into the stark white ice cream shop, I kind of felt like I was in an upscale boutique or beauty salon. Everything was pristine and bright white--almost blinding. White leather couches occupy the middle of the restaurant with white tables and chairs strategically placed around the shop. Red Mango definitely didn't lose us as customers, but we'll be stopping by Snow Spoon again.